Why are Icicles a Huge Problem for Your Home? If you’re wondering what issues a harmless little icicle could possibly bring to your home, you might be in for a surprise. Here are the top reasons why icicles can cause chaos this winter, and potentially signify even bigger looming problems. While clogged gutters might not be on the top of your mind this winter, you might want to think otherwise if you find icicles appearing. It’s no secret that icicles are the result of frozen water, and it’s a sign that your gutters might be clogged up from old leaves. As if clogged gutters aren’t trouble enough, icicles add an even bigger problem: excessive weight on your gutter system. Clogged gutters can ultimately freeze normal runoff water that flows from your roof. Consequently, this runoff water puts a lot of weight on gutter fasteners and creates ice dams—and they can also cause icicles to form as well. When icicles and ice dams weighs down your gutter, they become very heavy and can tear away from your home. If you’ve found a lot of ice around your gutters that you can’t tackle on your own, it’s smart to contact a roofing professional for help. Airflow is extremely important when it comes to your attic. You need airflow to make its way through your attic space to prevent moisture and mold growth. 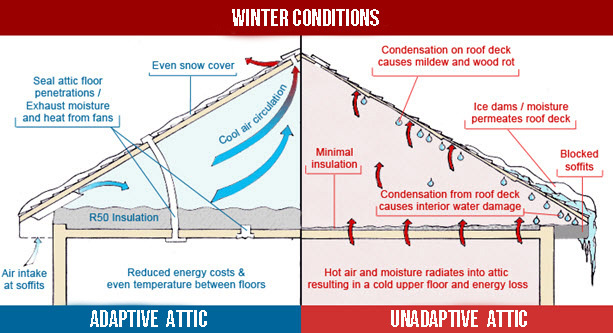 If your attic isn’t properly ventilated, icicles may form on the outside of your home. The root cause of icicles in this case is too much heat escaping from the attic, which may result from inadequate ventilation. While we know that icicles can signify a gutter blockage, don’t forget that damage to your gutters can also impact your roof. Eventually, this damage can make its way indoors and damage the home’s interior such as ceilings, walls, and even your carpet and flooring. What Should You do if You Discover Icicles? If you find icicles forming on your roof and gutters, there’s no need to panic. However, we must caution you that it’s generally not a good idea to remove the buildup on your own. Don’t try to remove the icicles with a hammer or a rake, as this can put additional strain on your gutters. Hire a pro to get the job done for you, and be sure to clean out your gutter system and address any ventilation issues as soon as you can.